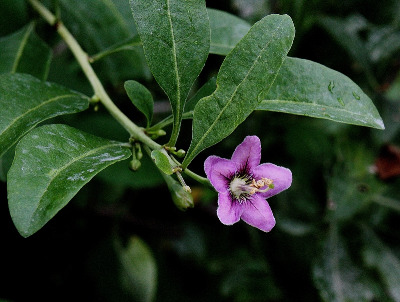 Apparently a native of Asia, widely cultivated (e.g., for hedges, because of the thorns) and occasionally escaped to disturbed ground, including roadsides, railroads, sites of old buildings, and dry open fields. First collected in 1882 in Kent Co.
As now recognized, this species includes L. halimifolium Mill. The corolla lobes in our specimens run ca. 4–7 mm long, a bit longer than often stated. Selections of this species especially are now popular among health food devotees for the fruit, known as Goji Berries. MICHIGAN FLORA ONLINE. A. A. Reznicek, E. G. Voss, & B. S. Walters. February 2011. University of Michigan. Web. April 21, 2019. https://michiganflora.net/species.aspx?id=2698.